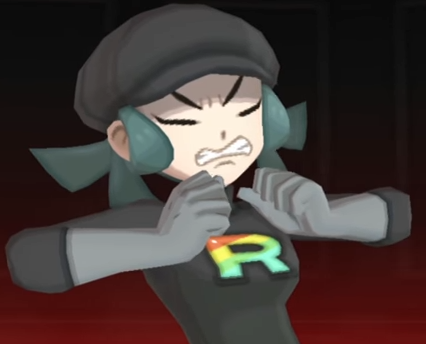 This Team Rainbow Rocket Grunt is expressing how I feel about the game. If you read my points in that October 18 and November 2 article, literally everything I said about exactly how whatever new content The Pokémon Company International was showing off would be implemented... CAME TRUE. That's the correct usage of the word “literally”, by the way. I really don't want to spoil the games, but most of it really is the same as the first Pokémon Sun and Pokémon Moon, which The Pokémon Company International already spoiled when they were promoting this game. In fact, they pretty much spoiled the Ultra games as well. As I told you way ahead of time, the new stuff is all overhyped and less substantial than the trailers made them out to be. You know, if Game Freak is going to make story a big focus for the games, then the story (and CHARACTERS) should be, oh I don't know, well-written and paced? They can look at what Chunsoft has been doing for Pokémon Mystery Dungeon as inspiration. Y'all called me a senseless cynical jerk, but, I mean, I was right the whole time since the games were announced. I only recommend you buy them if you didn't buy the first Sun and Moon, or you play in the Pokémon Video Game Championships and need those new move tutors or something. Just for your reference, the original Pokémon Sun and Pokémon Moon won KoopaTV's Best 3DS Game of 2016 Game of THAT Year award. Don't get the impression that the KoopaTV staff hates Pokémon or anything, because that would be wrong. Here's looking forward to what Game Freak can do on the Nintendo Switch! In comparison to Emerald and Platinum, USUM are much, MUCH better, in my opinion. These games introduce new Pokémon (a total of five, not counting forms) which is the first time a third version has ever done this, a larger post-ending, buffs to Pokémon old and new, more catering to the competitive meta of the carts, and much more I won't bring up here. That being said, they're back-peddling for money. They went from BW to B2W2- actual sequals- XY straight to SM, and back to the third version crap they kept exploiting. This is something I've resented for a very long time. The games themselves are great, and I myself would encourage giving them a try if you're willing to spend the cash for it. As for the the Hau thing? I disagree with the notion that he would become a character as significant as Looker or Cynthia. Cynthia has a very large standing in Pokémon as one of the most popular champions in the game while Looker is significant in both popularity and story. Hau's changes in USUM- without spoilering anything- has been done before with other characters, and they weren't reused in future titles. In short; the games have good quality, but only if the games themselves are your thing. You could always just go to Showdown or PO if the multiplayer matchups are your only interests. First of all... no comment on you being in the article? I mean, your picture is sooo cuuuute. USUM tried really hard to, well, I'll say it as it is: fool people. They didn't ever fool me, but they did fool, well, let's put the number at "millions." Nintendo really just needed a big way to end the 3DS's lifecycle since this is PROBABLY the 3DS's last holiday season, so they're like, "Hey Game Freak, make a third/fourth version of last year's game with your Jr. team while your senior folks make Pokémon Switch." "Sure!" So we get this. If they were jerks enough, they'll make Hau the next big thing. I don't honestly think they'll do that, but the possibility of it makes me upset. If they weren't trying to fool people with E or P, why would they start now with USUM? Pokémon is a huge game- they can release games like E and P and still roll in the currency. They've been doing it for years. And if they really were attempting to fool people- they did a horrible job. The advertising of USUM were some of the worst in Pokémon main game history. At this time, mostly everyone knows these games are tied to SM's original storyline. If they didn't know it before, that's not because of GameFreak attempting to fool them into thinking so- this is the first time a double third version has happened, and with the recent generations seemingly cutting out of the old trend, some would assume them to be sequels if they didn't do their homework. All things said- the games have enough additional content added to separate themselves further from their counterparts, versus how E and P were almost identical cut-outs, bar a few twists. USUM are confirmed to be the last Pokémon games of the 3DS, and even if they aren't original titles themselves, they'll still sell like hotcakes. Such is the testament of Pokémon's popularity. Lycanroc-Dusk was an anime promotion. And even I'll admit that it was poorly handled altogether. However, the spotlight didn't last throughout the entire pre-release. It was only revealed in its reveal trailer, and had minor appearances in other trailers. The only manner in which it felt forced was its exclusiveness- time set evolution, recolor/reimage of midday, a whole 2 point BST difference versus midday- it was a disaster altogether. Otherwise I don't feel that its in my face. Hau will never be the next big thing, I'm guaranteeing this. He has a fanbase, but its no where near as big as, say, Lillie's, or Guzma's. Why would they start now? Well, that was 10 years ago. There's been new management and a cultural shift at the company since. I don't think they did a horrible job, considering millions of people will have been fooled by it. I saw a lot of social media posts that were making fun of cynical people like me after each new USUM trailer talking about how significantly different the games will be. I'd argue USUM falls under "new twists" if Platinum's additions are "new twists." ...well there's no equivalent page on Serebii for USUM, but there's all sorts of stuff that happened. Substantive story changes. New Pokémon formes for legendaries/mythicals/Rotom. Game mechanic changes. Giratina's dimension is equivalent to all of the one-room additions for the Ultra Wormholes. Lycanroc-Dusk will probably go ahead to be a Poké Ball Pokémon in a future Smash game. It won't be playable since they like bipedal dudes as playable. But it has an anime tie-in, an event, a special Z-Move too. That's pushing it. "Y'all called me a senseless cynical jerk, but, I mean, I was right the whole time since the games were announced." I had absolutely no interest at all. I was even at the Ultra games event in Nintendo NY and did not even pick up the game they were promoting. My baby and I took a picture with the Pikachu mascot costume guy with our Kangaskhan hats. Was your baby in your pouch? I wanted to use a baby carrier for the purpose of having something like a pouch but I was going there alone since my husband was working and by the time he would be out it most likely would be too late so i just used a stroller through the horrible NYC subway system. I have nothing but contempt for strollers, as someone who ran into a woman's shopping cart in a store parking lot. I'm not mad! I didn't LOSE anything from this. "Just for your reference, the original Just for your reference, the original Pokémon Sun and Pokémon Moon won KoopaTV's Best 3DS Game of 2017 Game of THAT Year award. Sun and Pokémon Moon won KoopaTV's Best 3DS Game of 2017 Game of THAT Year award." You should not have ever second guessed yourself. From the very beginning when the trailer was released, it was very obvious that these games would be very similar to their predecessors. The very few changes that were made are not substantial enough for me to pick them up either. I somehow copy and pasted the line from the footer twice. Muphry's law strikes again. ...Yeah you're only gonna get 1 Correction Corner point for screwing up my beautiful composition.